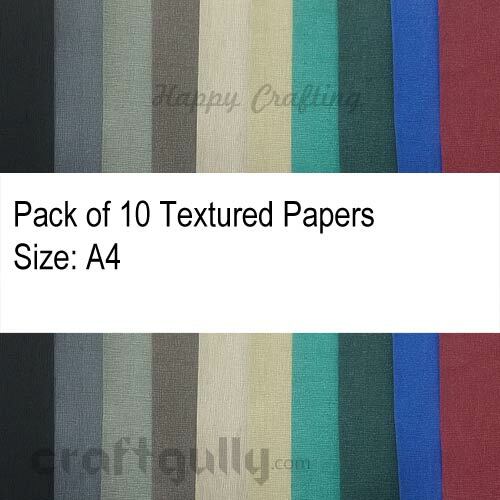 A must have for all crafters! 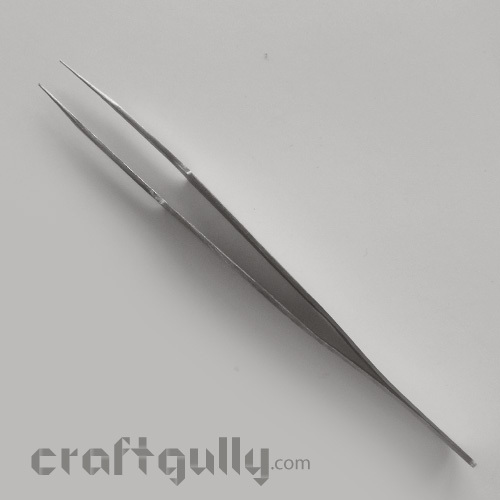 Made of stainless steel, these tweezers are perfect for all kinds of crafts which involve small minute components, especially quilling and punchcraft. The fine point tip makes it easier to handle, glue, position and assemble your project. The curved tip allows for a more natural movement while working and is easy on the hands when you need to hold your piece in position while waiting for the glue to dry. 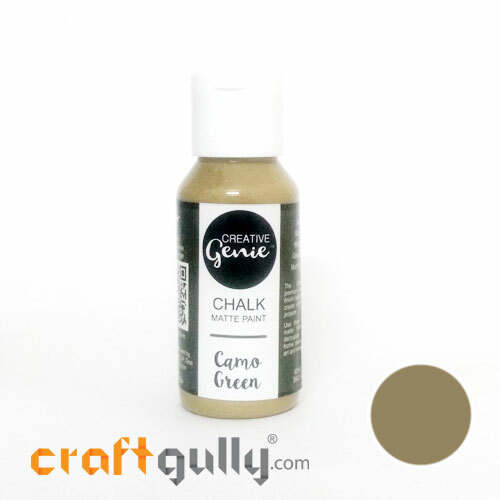 Size: 120mm x 10mm True color/s may vary slightly from what you see on your screen..
A must have for all crafters! 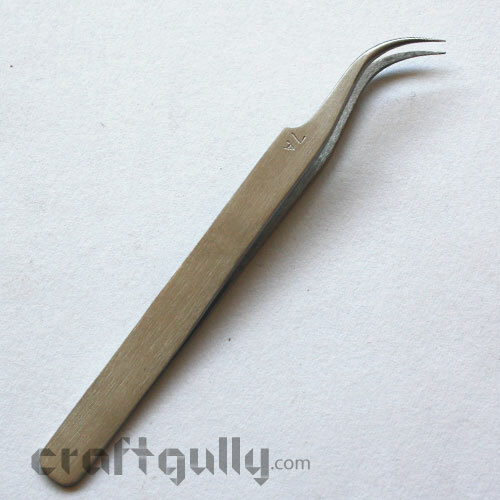 Made of Stainless Steel, these tweezers are perfect for all kinds of crafts which involve small minute components, especially quilling, jewellery making and punchcraft. The fine point tip makes it easier to handle, glue, position and assemble your project. This tweezer comes with a protective plastic tube clasp to keep the tips together when not in use.Size: 140mm x 8mm.. 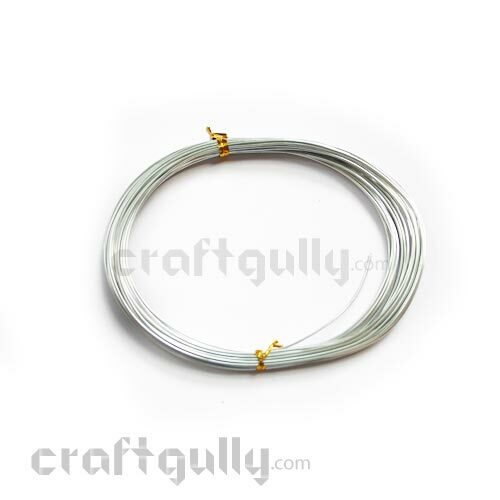 Very flexible and easy to work with, this colored wire with a aluminium base is great for jewellery making, flower making, and other general crafts. Diameter of wire: Approx 1.0mm Length of wire: Approx 10 metersColor: Silver *True color/s may vary slightly from what you see on your screen.. Very flexible and easy to work with, this colored wire with a copper base is great for jewellery making and other general crafts. Size: Approx 0.3mm Length: Approx 12 metersColor: Golden Color may vary slightly from what you see on your screen.. Very flexible and easy to work with, this colored wire with a copper base is great for jewellery making and other general crafts. Size: Approx 0.3mmLength: Approx 9.5 metersColor: Silver Finish Color may vary slightly from what you see on your screen.. The easiest wire to work with when it comes to beaded jewellery, tiger tail wire does not require a needle to work with. It is made from inter-twined stainless steel and coated with nylon, making it strong with no fraying. Diameter: Approx 0.38mm Length: Approx 10mColor: Old Gold True colors may vary slightly from what you see on your screen.. The easiest wire to work with when it comes to beaded jewellery, tiger tail wire does not require a needle to work with. It is made from inter-twined stainless steel and coated with nylon, making it strong with no fraying. Diameter: Approx 0.38mm Length: Approx 10mColor: Old Silver True colors may vary slightly from what you see on your screenPlease note: The spools of the wires may vary from what is shown in the image..
Great for making bracelets, anklets and even keychains, all you need is some beads and your jewellery is ready in a jiffy!!.. Great for making bracelets, anklets and even keychains, all you need is some beads and your jewellery is ready in a jiffy!! Diameter of wire: Approx. 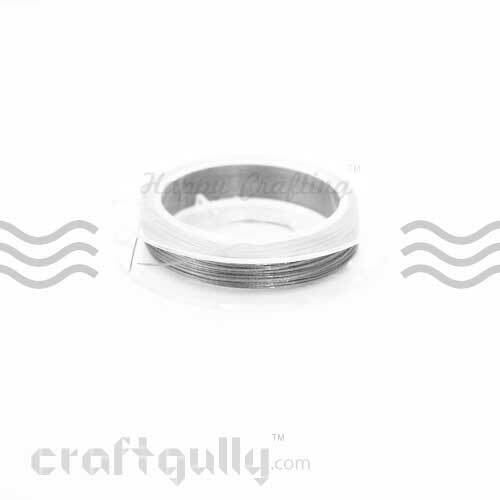 1.0mm Length of wire: Approx 10m True colors may vary slightly from what you see on your screen..
A handy tool that allows you to work with jump rings and create projects with great ease and speed. Just slip it on any finger that is convenient to you and open jump rings exactly the way they should be - gently sideways. Works with jump rings of all sizes. One size fits all. A must have for every jewellery maker! 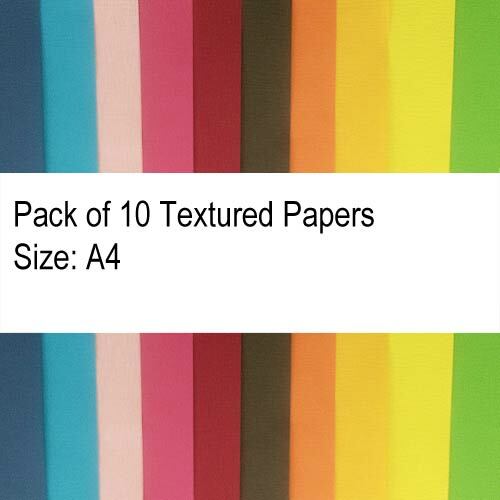 Size: Free SizeMaterial: MetalQuantity: Pack of 1True color/s may vary slightly from what you see on your screen..
Tough and break resistant, nylon threads are great to use for all-day-wear jewellery. Its perfect for when kids want to make their own jewellery too! 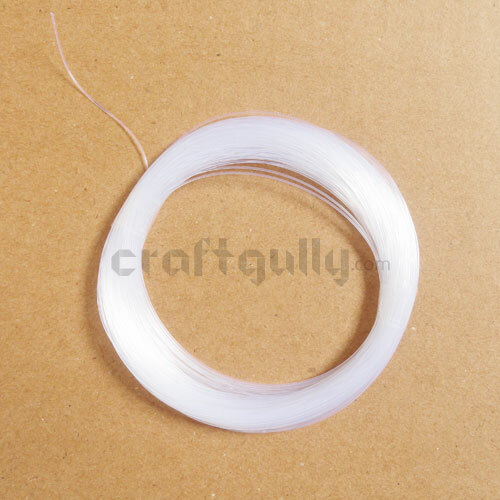 Size: 0.5mm Length: 45 metres..
Tough and break resistant, nylon threads are great to use for all-day-wear jewellery. Its perfect for when kids want to make their own jewellery too! Size: Approx 0.7mm Length: Approx 45 metres.. Twist, fold or simply hold in place. these Bent nose pliers give you extra grip and can be used in place of tweezers too! Colors are indicative, and may be different from the one you receive. 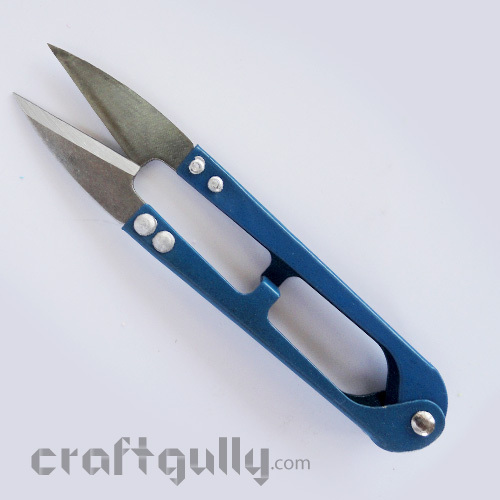 ..
Get extra reach and grip when working on your detailed projects with these long nose pliers. Colors are indicative, and may be different from the one you receive. .. 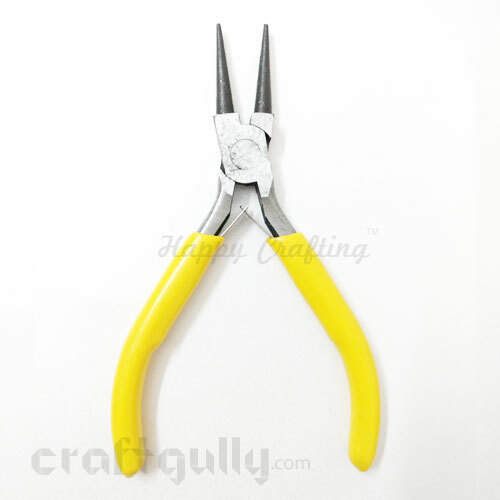 Ideal for bending wires, making eye pins and making wire jewellery, these round nose pliers are a must have, when working with wires for flower making, jewellery making, and other crafts. Colors are indicative, and may be different from the one you receive. 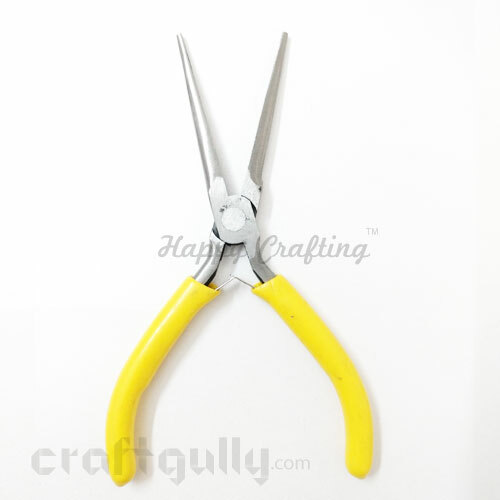 ..
Get clean precise ends when cutting your wires with these top end wire cutters. Makes cutting from the top end very neat and easy. 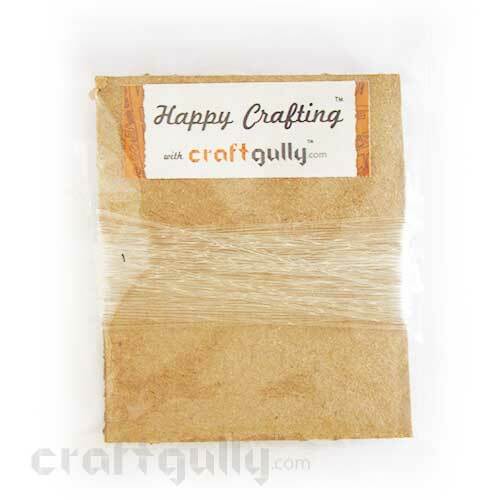 A must have when working with wires for flower making, jewellery making, and other crafts. Colors are indicative, and may be different from the one you receive. ..